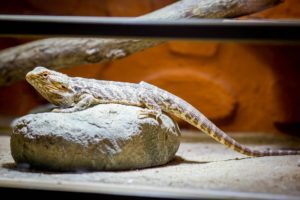 You may already have a few ideas on how you plan to decorate your turtle tank, but first you should take a few things into consideration. One thing is how large of a budget you have to work with. If you have a large budget there will be a number of decoration ideas you can explore. 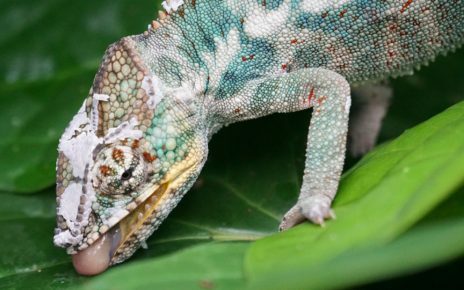 If money is not an issue, the easiest thing to do is buy ready-made products to decorate your tank. On the other hand, if you have a limited budget, you can make do with home made decorations. If you are working with a small budget this may limit how many decorations you can buy. But a limited budget doesn’t mean you can’t design a very nice looking tank. 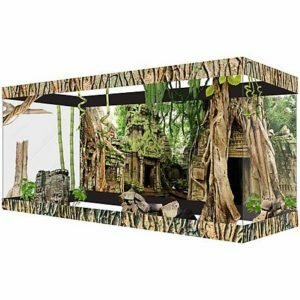 There are quite a few very affordable decorations available, that can add some visual interest to a turtle tank without busting your budget. After deciding on your decoration budget, it’s a good idea to think about what kind of look and style you are aiming for in your turtle tank. Some people prefer a simple tank where the decorations serve a functional role. In those cases, a turtle tank is setup where the decorations are meant to serve the needs of the turtle, and are usually limited to basking platforms and gravel. This can be a good starting point for beginners, and the decorations can be reused later on in a more complex setup. A slightly more complex design is to create a more natural looking environment inside the turtle tank. 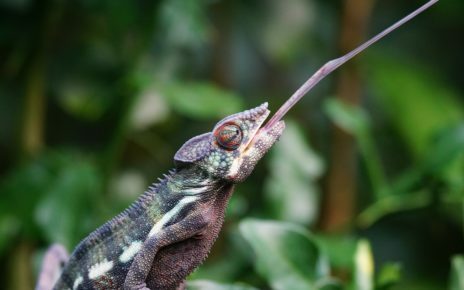 This can be achieved by adding either artificial or real plants to the tank. Along with plants, logs and branches will add to a more natural look. These organic elements will also provide hiding spots for the turtles. And a more natural décor will make a turtle feel less stressed and more at home. It will also be a much more attractive center piece in your home as well. Basking platforms are one of the most important decorations in most turtle tanks. These decorations serve the very important purpose of allowing a turtle to exit the water and bask. That makes choosing the right one much more important than just simply picking one based on aesthetics. A basking platform first and foremost will have to be large enough for one or more turtles to lay on. 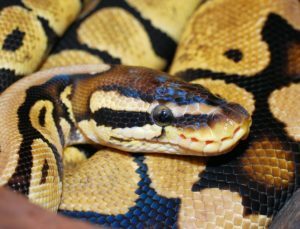 The platform will also have to be easy enough for a turtle to pull themselves onto. If it’s too hard to get on the platform the turtle may never use it. Once the turtle’s needs are taken into account, then you can focus on how the platform will act as a decoration. When it comes to selecting a basking platform they are available in a wide range of designs and configurations. Basking platforms can either be directly placed on the floor of the tank or on an embankment. These types of platforms are best suited for shallow water tanks, where the platform can easily be placed above the water line. 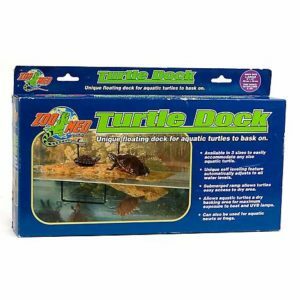 The other major type of basking platform is the floating platform/dock, which is made for deep water turtle tanks. A floating platform/dock can be attached with suction cups to any point of the tank. Plants are one of the decorations that can transform a turtle tank into a more natural looking habitat for a turtle. While plants are not a necessity, they are one of the most affordable and attractive decorations you can add to a turtle tank. 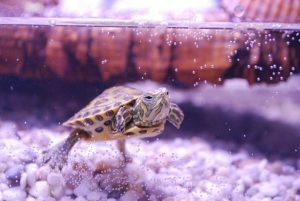 When adding plants to a turtle tank, you can either choose to use artificial or natural plants. Artificial plants have the benefit of requiring no maintenance, and they are resistant to any damage the turtles may cause to them. 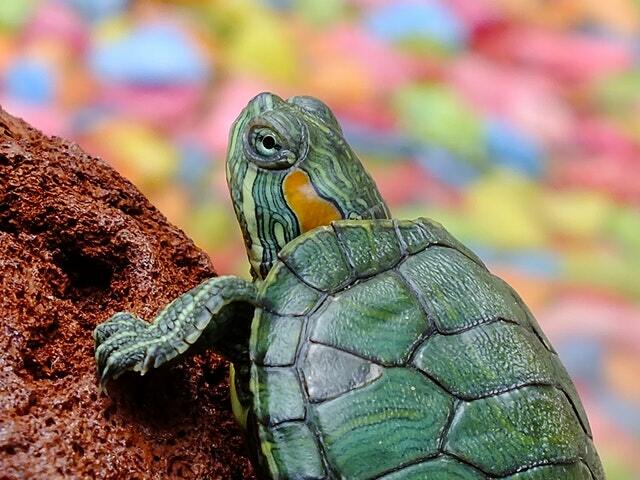 If instead, you choose to add natural plants to a turtle tank, you will need to maintain them. And you will have to only choose varieties that will not be harmed by your turtles. Whether you decide on going with artificial or natural plants, the next step is selecting a good mix of plants to add visual interest to all levels of the tank. Starting with the plants in the aquatic zone, you should pick a mix of low plants for the foreground, and long floating plants for the background. If the water surface is large enough you can consider adding water lilies or other similar floating plants. When adding plants to the land or the floating dock portion of the tank, you should pick plants that will add some visual appeal to the surface area. When selecting plants for the land area try not to add so many plants that they impede the movement of the turtles. The last level of planting is along the walls of the tank, if you have enough room you can attach air plants or other vines to the walls. Plants along the walls can also be used to hide equipment or wires. The plants along the wall will also provide good places to hide water falls and other points of interest. 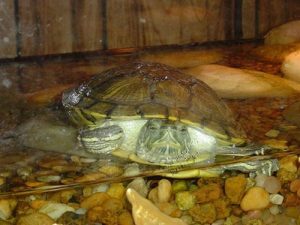 Giving your turtles a place to hide is always a good idea, so the turtles can feel safe and remain stress-free, While hideaways serve a very functional role, they also play a big role in decorating a turtle tank. For this reason, turtle hideaways come in a wide variety of sizes and designs. The most important thing when selecting a hideaway is size. 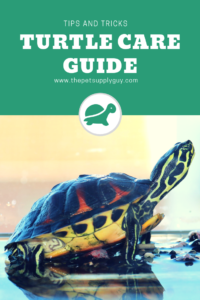 If you have a turtle that will grow to be much larger than they are today. Pick a hideaway that will meet their needs, so they can make use of it throughout their lives. After you have decided on the right size hideaway you can then focus on looks. Two of the more common hideaways are rocks and logs. Rocks will fit nicely into a rock garden design where you can blend it into the preexisting layout. 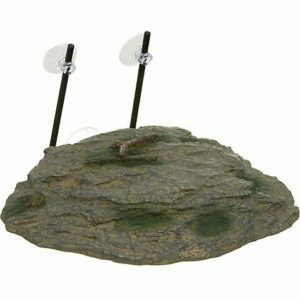 Or if the rock hideaway is particularly attractive you can make it the center piece of your design. For more aquatic riparian tanks log hideaways will usually fit in nicely. Logs can be incorporated into arrangements of plants. Or they can be made to look like part of a decaying forest floor surrounded by dead branches and other organic decorations. Adding a background to a turtle tank can be a quick low-cost way to add some appeal with minimal effort. There are two main types of backgrounds external and internal. While they both enhance the look of a turtle tank, each one has its pros and cons. External backgrounds are essentially stickers that cover the back of the tank. 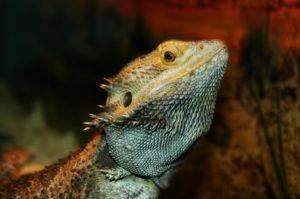 They can have any graphic printed on them from a photo real nature scene, to a completely artificial and abstract design. 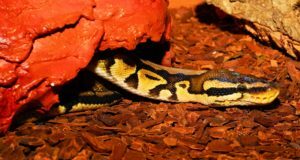 The major advantage of an external background is that they can be easily placed on a tank, even one that is currently occupied. There are also kits to wrap other parts of the tank which can add to a more complete design. The downsides to an external background are that they tend to look less natural and can come off as looking a little artificial. 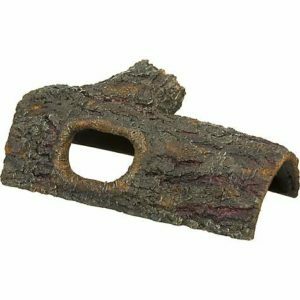 Internal backgrounds are a three-dimensional insert that you attach to the back of your tank. The insert is usually a few inches thick, and has a natural design such as tree roots, rocks or other patterns. Internal backgrounds will look very natural and will even have locations carved into the surface for turtles to hide, or for plants to be placed. The overall look of the tank will be closer to a zoo exhibit instead of just a plain glass tank. There are some downsides to an internal background ranging from installation to maintenance. First, the installation will be harder, especially if you have turtles, gravel and other decorations already int the tank. Internal backgrounds tend to have a depth of three to four inches. So in order to make room for the background. It will be necessary to push any gravel and decorations away from the back wall of the tank. And besides the installation challenges, an internal background will require more cleaning especially if it has a more complex surface. 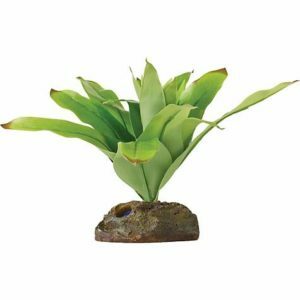 The Exo-Terra Bromelia is a nice small plant that will work well mounted on the ground in an aquarium. This plant even comes with a detachable rock for easy placement. 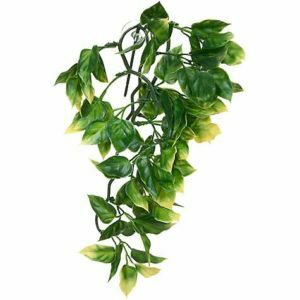 This plant can be used alone or it can be part of a more complex arrangement. 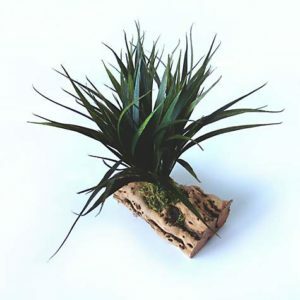 The Reptile Grass Log is a good size plant that would fit in well in most turtle aquariums. This plant is good for medium or large tanks. And this plant would work well on the surface or in the water. The Exo-Terra Amapallo Jungle Plant is a perfect plant for covering the walls or any other surface in a turtle tank. This plant can also be used to cover equipment or hide the outlet of a water fall. The Jungle Ruins Background is a South American themed wrap kit. It comes with all you need to give your tank a complete exterior upgrade. The kit comes with a reusable background along with stickers that can be placed on the glass and the frame of the tank. The T-Rex Rock Ridge Background, will help create a more natural looking turtle tank. The background is designed for 20-gallon tanks. With basking platforms and hideaways built in this background can be a cornerstone decoration in any tank. The Penn Plax Paradise Isle, is a large floating island with a nice design and plenty of room for one or more turtles. 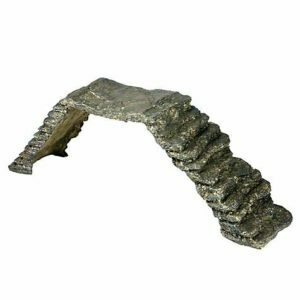 This is a good platform if you want to add some tropical island whimsy to your turtle tank. 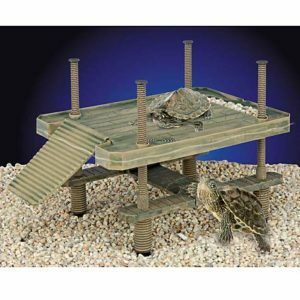 The Penn Plax Floating Turtle-Pier, is a very well made realistic looking platform that can easily accommodate multiple turtles. The platforms attractive design will make it a perfect fit in a wide range of turtle tanks. 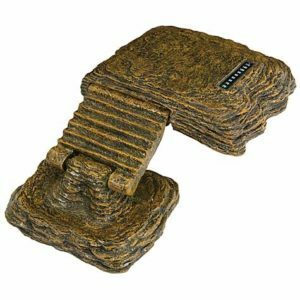 The Zilla Floating Basking Platform is a medium sized platform that can be mounted with the included suction cups. The natural looking rock design will fit in nicely with the gravel and rocks of most turtle tanks. The Zoo Med Turtle Dock is quite large and has a very easy to climb ramp. This ramp can securely hold two or more turtles. The rock texture is compatible with most habitats, and the platform is very sturdy making it one of the better platforms available. The TetraFauna Floating Turtle Island is great for a tank with one turtle or even a couple of small turtles. The platform has a built-in thermometer to easily monitor basking temperatures. The ramp is easy to climb, and the overall design is very attractive. 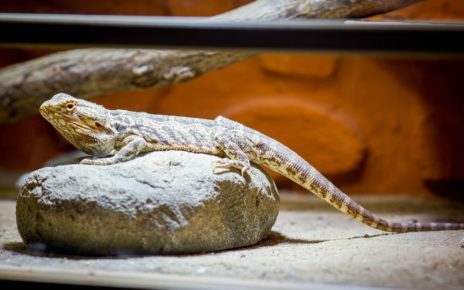 The Zilla Basking Platform with Ramp is made to be placed on the floor of the tank, which makes it better suited for shallow water tanks. The ramp is easy to climb and the platform is quite long, which makes it a good fit for larger turtles. 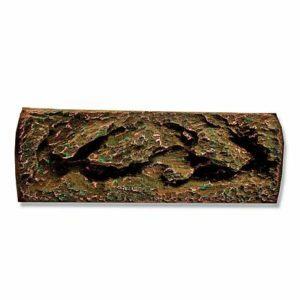 The Zilla Reptile Bark Bends hideaway is the perfect size for almost any turtle. 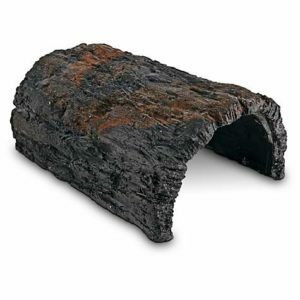 The 12-inch log has lots of character since it is designed to look like an old decaying log. The log is very versatile and can be placed underwater or on land. The Conceptual Creations Large Bark Log is medium sized and is good for small to medium turtles. The log has a nice exterior finish and will easily blend into most natural designs. 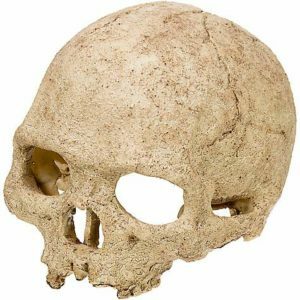 The Exo-Terra Primate Skull Hideaway is great for people who want to add a little morbid whimsy to their turtle tank. The skull hideaway is a little small so it is only good for smaller turtles. 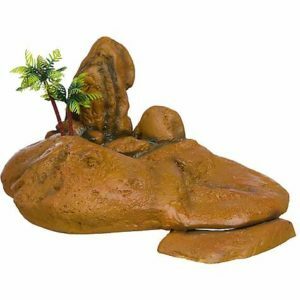 But if you are using it as a decoration, it would fit nicely into a lost jungle themed turtle tank.